Years after he left the jungles of Africa behind, Tarzan (Alexander Skarsgård), now known as John Clayton, a.k.a. Lord Greystoke, is living a comfortable life in his mansion in England with his wife, Jane (Margot Robbie). Their only sorrow is that they do not yet have a child. When he's invited back to the Congo to serve as a trade emissary of Parliament, he initially turns down the invitation, not wanting to return to Africa. However, he's soon convinced to go, unaware that he's a pawn in a deadly convergence of greed and revenge, masterminded by Leon Rom (Christoph Waltz), who will do anything to get his hands on the diamonds of Opar. Rom has struck a deal with Chief Mbonga (Djimon Hounsou) to bring him Tarzan in order to settle a score. In return, Mbonga will provide Rom with diamonds. However, he has no idea what Rom is up to and what he is doing to the tribes of the Congo. 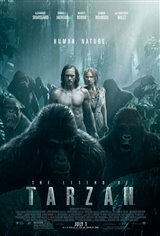 Based on the Tarzan series of books by Edgar Rice Burroughs.